UK.COM is the premium domain extension for both recognition and flexibility, giving businesses and consumers alike the opportunity to navigate, communicate and promote themselves on the internet whilst combining a British identity with worldwide appeal. A UK.COM is a great way for website owners to develop trust amongst UK visitors and drive traffic from UK search results. Tea Party loves having a UK.COM address! Shows we are based in the UK, proud and the com means.....yes, we mean business!! Also sounds rather nice....rolls off the tongue with ease. Having a UK.COM web address means that we stand out from the crowd, and as we're all about originality, it is the perfect format for our online presence. The .UK.COM namespace offers a great opportunity for any serious business catering to the UK. What better way to define your focus than with the dot com for the United Kingdom. A .UK.COM gives you an international domain with a British touch, a great choice for British Businesses that want to go global. UK.COM offers consumers and businesses a domain that is not only local to the UK but also has all the advantages of being seen as a global player. UK.COM has natural appeal for all manner of corporate and public uses within the UK. 2 Character Domains are now available on a first come, first served basis. Offering everything you want in a domain name and more, these bite-sized bits of powerful internet real-estate even allow you to get your initials in a web address. We can't wait to see if Kylie beats Kate to km.uk.com - now that Kate Middleton won't be needing it of course. ok.uk.com, do.uk.com, so.uk.com, my.uk.com and hundreds more. If you want to stand out with a memorable web address and enable customers to find you easily, this is the domain name for you. A 2 Character Domain is the ultimate investment piece, and a fabulous birthday or commemorative gift for those who have it all. Visit one of our registrars today to secure your favourite 2 characters in a UK.COM domain name. We always knew that selecting one overall UK.COM Awards winner would be no mean feat, so we surrendered the grueling task to our expert judging panel who left no stone unturned in scouring and scoring each and every one of the 24 finalist websites. Rating everything from concept to execution, including functionality, innovation and design, our elite group of technology, media and business specialists slowly narrowed the final lineup of lateral thinkers and creative leapers using UK.COM domains down to just one! 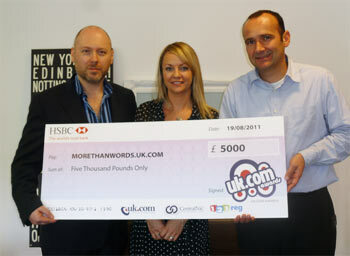 Congratulations MoreThanWords.uk.com for wooing the judges and taking out first honours in the inaugural UK.COM Awards! Double congratulations for becoming the recipient of the £5000 cash prize. The big cheque presentation: Left - Right, CentralNic & UK.COM CEO, Ben Crawford, More Than Words Owner (aka UK.COM Awards winner), Lisa Long, and 123-reg Managing Director, Thomas Vollrath. © Copyright www.UK.com 2019. All Rights Reserved. Powered by CentralNic LTD.